Dimensions (HxWxD): 24" x 19" x 14"
The Swingline™ DS22-13 shredder is a strip cut shredder suitable for use in departments as it meets the needs of small departments. The strip cut shredder shreds paper, optical media, credit cards, staples, and paper clips. The incorporated Jam Free™ technology enables the Swingline™ DS22-13 shredder to shred continuously. The Jam Free™ shredder stops shredding and blinks whenever excessive papers have been fed. The Jam Free™ shredder features thermal overload protection. 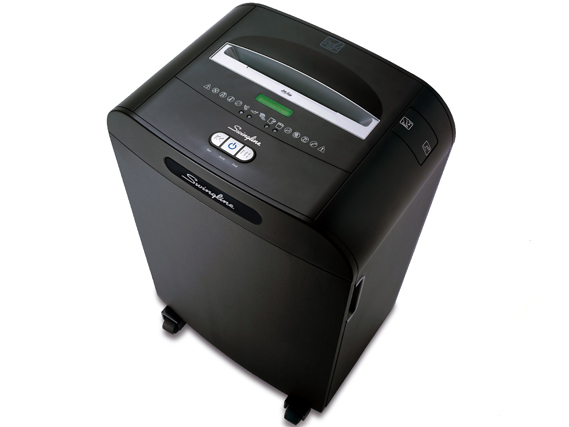 The strip cut shredder's sleep mode saves on utility costs. The Swingline™ DS22-13 shredder's wire-frame waste bin configuration features a bin full indicator. The Swingline™ shredder's cutting blades are backed by a lifetime warranty. Jam Free™ technology prevents paper jams. Auto power save mode reduces utility costs. Continuous shredding results in greater production.